When are you supposed to start tomato seeds? When the oak leaf is as big as a squirrel's ear? Or is it when the crocus have bloomed and faded? Or perhaps when the weeping willow drops 17 twigs per hour? Oh I don't know, and I can't remember when I started my seeds last year. And that's why I started this gardening notebook! I could never remember when I started certain seeds, and then when to begin the transplant process. 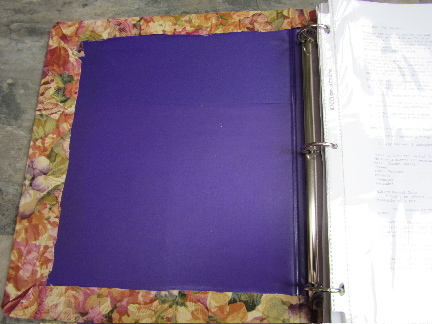 This is just a leftover plastic binder, from a conference my husband attended many years ago, that I've made pretty with some fabric. As nice as it looks from the outside, it's what's inside that keeps my gardening organized. These "special features" are just binder odds and ends. 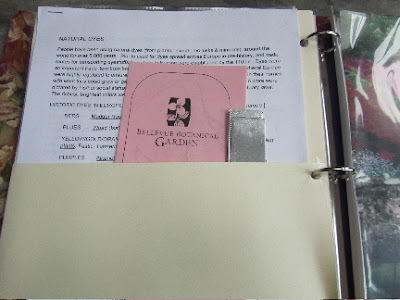 Several years ago, our garden club put together garden notebooks. 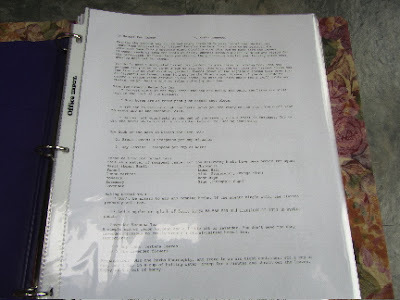 We each brought our own binders, then shared packets of notebook organizing pages, purchased from Office Depot. 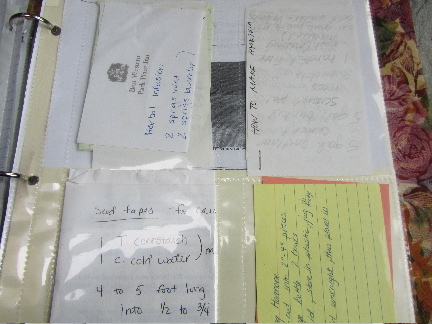 The 4-section photograph holder page is perfect for keeping notecards with special how-to info, such as making hypertufa, using herbs and blossoms in bath bombs and salts, and making hosta leaves with concrete. 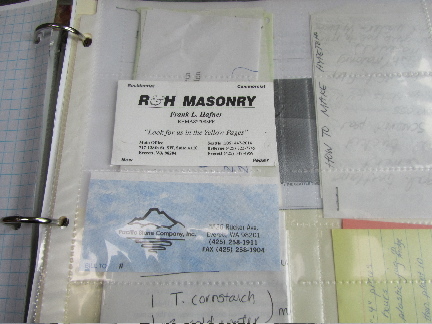 The multi-section business card holder is where I keep info like the guy who grinds stumps for us, and the service that takes out or trims trees, the contact info for a stone mason, and stone supply, etc. 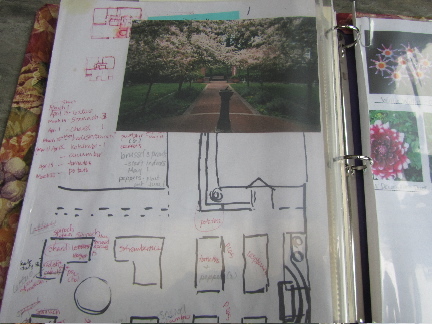 and photos and sketches of gardens that I love. There's a pocket page for catalogs, tree tags and other items that wouldn't otherwise fit into other pages. 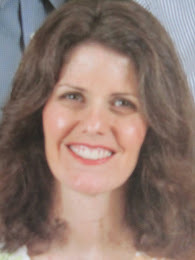 I do save old fruit tree and vegetable seeds catalogs, for their valuable information on care and disease/pest prevention with our trees, and seed planting info that goes beyond what may be on the back of a packet of seeds. And, of course, there's that sheet of when I am supposed to start certain seeds indoors, when I should transplant seedlings to the garden, and by what date do I start seeds for the fall garden. All important stuff. 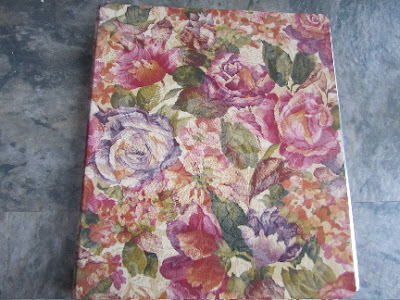 To prettify my plastic notebook, I wrapped fabric around the exterior of the notebook, and adhered with a rubber cement-type adhesive. 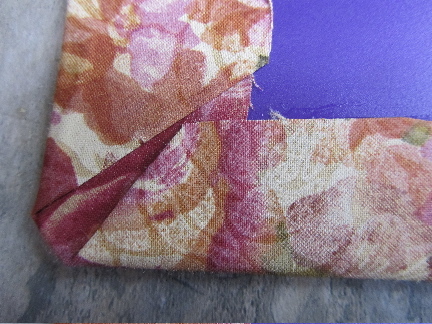 I could cover the inside ends with sheets of scrapbook paper. Maybe I'll get to that soon. For now, I'm happy with how it looks and works. What a good idea. So simple too. I have tried to make notes on the family calendar in the past but of course they get lost in family minutiae. Bits of information that I only use once per year is just so hard for me to remember. So this book really does help with that, for me. 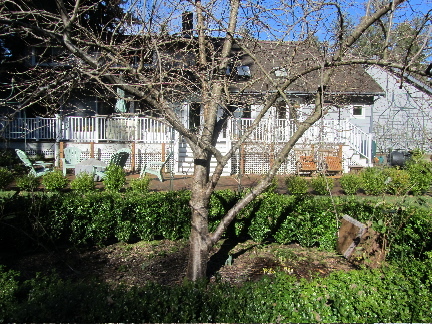 It's the one place that we can look for all kinds of information related to the garden. I have something similar except not so well organized. I'll put updating and organizing what I have on my list of things to do. However, I don't know when it will make it to the top of the list to get done. However, the beginning of this growing season would be a good time. I'm one of those people who need to have a place for everything, if I want to stay organized. So, all these binder odds and ends really help me with that. At least now, if something gets taken out of the binder for use, then at some point, I will know where to return it to. We just recently helped my son buy a car for a new job. His first one. A milestone. This will be my son's first car, as well. That first car is a big deal! Thank you. Just a way to keep my gardening organized. I can hardly believe that it's almost time to be working in the dirt again! I started a bunch of seeds indoors the other day, to transplant out to the garden around the first of April. Your garden notebook is such a good idea. I am a hopeless gardener and can never remember what one should do when. Luckily my mother is an excellent source of information! I could do with a notebook like yours. Thanks so much for your advice and suggestions on my sewing. I have still not decided what to make but I really appreciated everyone's thoughts. Thank you. I could never remember what to do and when, either. But very fortunate for you to have your mother for information! Good luck on your sewing project. I love the fabric you chose -- so summery! Half the fun is in the planning, don't you think?! Whichever project you choose, though, I'm sure it will turn out well. You are so organised :) I just throw everything in and hope for the best. Which reminds me, I need to move my tomatoes to a sunnier spot! How is your portable garden doing? Are you getting very many fresh tomatoes? Mmmm, what I wouldn't give for a fresh picked tomato right now. I'll just have to wait my turn! I always think of a gardening journal as just a notebook, but yours is more like a scrapbook with add-ins. Cool! Thanks! It's my way of keeping all my garden-related stuff together in an organized fashion. 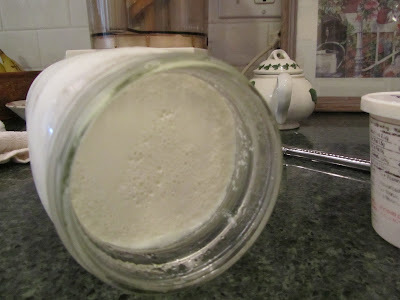 Maybe it's more than some folks need, but for me, it's essential. I am so envious of how organized you are!! We are so ready for garden planting time. I'm keeping my fingers crossed that spring weather will cooperate and I can plant out some seedlings in April. Working outside in spring is so joyful, even if it is a bit nippy here. Hope your garden planting time comes soon!